In this northern corner of the Adriatic, the city of Venice shines so brightly that it threatens to overshadow the other ports along this coast, and that would be a pity. No matter whether you are on a private yacht or chartering a yacht in Italy there is plenty to explore. Rimini is a real seaside destination, where the Italians flock to enjoy the sun sea and sand – together with some other savvy Europeans. As well as miles of golden sands, there is lively nightlife, and a bustling tourist centre. Largely ignored by the throng is the old town which dates back for thousands of years, with the architecture to prove it. Ravenna, by contrast is a much quieter town, lying just inland and a visit here is an antidote to the noise and exuberance of Rimini, it’s no wonder it inspired the likes of Byron. And so to Venice, the only totally pedestrian city in the world, where boats and gondolas are the only traffic. There are several marinas within the lagoon which offer easy access to the city and a quiet retreat by night; but there is also the opportunity to take a berth right in the heart of the city close to St Mark’s Square. From here you can explore all the wonders Venice has to offer; wonderfully eclectic shopping and fascinating historical sites. 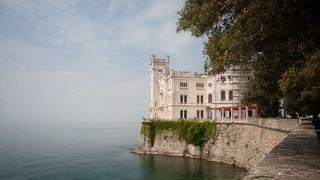 Trieste lies at the very end of the Italian coastline near the border with Slovenia. Sitting as it does where the Latin, Germanic and Slavic worlds meet; it is a fascinating mix, both in architecture, language and cuisine. Fine Viennese-style buildings rub shoulders with Roman ruins, and you can buy real Torte in the pastry shops. Trieste is also a very safe city so you can relax and explore the old town after dark as you find a local restaurant (or ‘buffet’ as they are called here) that will serve gnocchi Austrian-dumpling style, rich risotto and sausage with sauerkraut.